Happy Easter weekend! After a month long hiatus, I’ve now returned. The busyness of life had brought my creativity to a screeching halt and instead of anguishing over it I decided to sit in that blank creative space. To wait until sweet inspiration once again called my name. To be still and know. It’s fitting that Easter weekend has brought me my first signs of inspiration in a long time. A resurrection of inspiration. Creativity has always felt very spiritual to me. A quiet force of creation that flows freely and abundantly on it’s most generous of days. When it’s gone apart of you is missing and the longing is deep. Have you ever experienced a lack of creative inspiration? The good news is that it will always return. 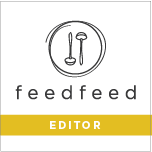 For me, it was an opportunity to experience other people’s work by way of old and new cookbooks. The excitement of flipping through them reminded me of why I love cooking. Trying out new recipes, with no pressure to develop my own, relaxed me. Each recipe was a breathe of inspiration and it slowly brought my creative thoughts back to life. How fitting for this weekend. 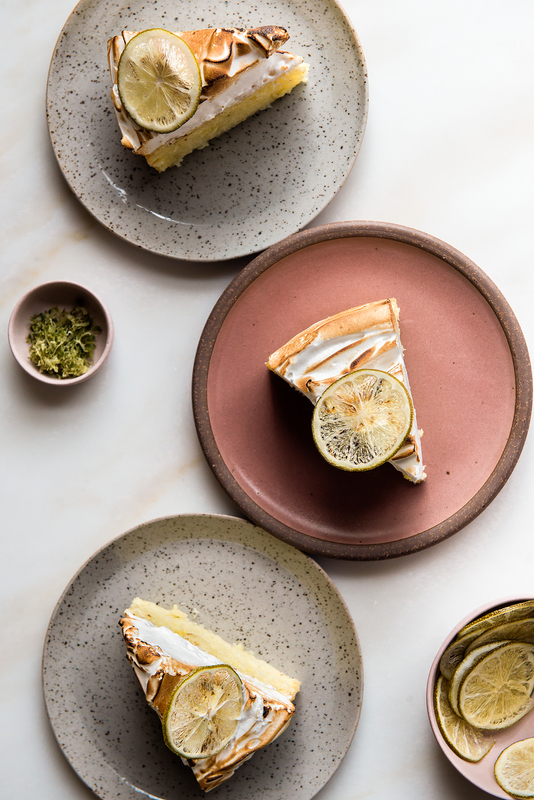 This Coconut Lime Tres Leches Cake is the first of many new ideas that I look forward to sharing this spring. Tres Leches Cake is a traditional Spanish cake that’s soaked with three different kinds of milk. The cake has a dense crumb and becomes even more tender after its milk bath. 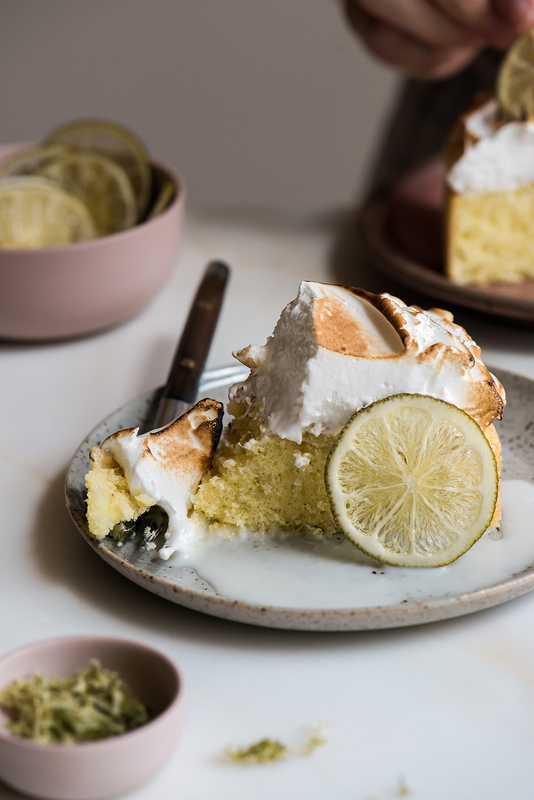 It’s incredibly moist and with a toasted meringue topping it tastes light as air. The coconut and lime compliment this cake well and it makes for a nice after Easter brunch dessert too. Cake is always a good idea, right? *For the candied lime chips, try and slice the lime as even and thin as possible. A clean cut will look the nicest and also bake more evenly. *For the Italian meringue topping, you’ll be cooking the sugar syrup to a specific temperature so have a candy thermometer on hand. Read through the entire recipe before beginning and have all your ingredients measured and ready to go. That way you’ll be ready to pour the hot syrup when it’s reached the required temperature. Using a sharp mandoline slicer, or serrated knife, cut lime into very thin slices (1/16″ thick or less). To prepare the simple syrup, combine the sugar and water in a small saucepan. Set over medium-high heat and bring to a boil. Cook until sugar has dissolved, about 1-2 minutes. Pour hot syrup into a shallow heatproof container (I used a 9×13 glass baking dish) and submerge the thin lime slices into the syrup. Allow lime slices to soak and cool overnight. Preheat oven to 200F (93C). Line a large baking sheet with a Silpat or parchment paper. Transfer soaked lime slices onto the lined baking sheet, evenly spaced, and place into the oven. Bake for 20 minutes. Flip each slice over and bake for another 10-15 minutes or until slices feel dry, but not browned (it’s ok if the slices are still slightly sticky to the touch). Remove from oven and set on cooling rack to cool. Lime chips will continue to dry the longer they sit in a warm and dry place, but may be used as soon as they’ve cooled. Store leftover candied lime chips in an airtight container, evenly spaced in a single layer, for up to 1 month. Preheat oven to 350F (176C). Butter an 8-inch round cake pan. Line the bottom with an 8-inch parchment round, butter parchment, and then lightly flour the cake pan. In a small bowl, whisk together the cake flour, shredded coconut flakes, baking powder, and kosher salt. In the bowl of stand mixer, with the paddle attachment, cream the butter until fluffy, about 1 minute. Meanwhile, in a separate bowl, rub together the lime zest and sugar with your fingertips to infuse the sugar. On low, stream in the lime sugar. Turn the mixer on medium-high and cream mixture for about 2 minutes. Stop and scrape down the bowl as needed. Add in eggs, one at a time, and mix until thoroughly combined. Add in vanilla extract and mix. Add in flour mixture and mix, on low, just until combined. Pour cake batter into prepared cake pan and evenly smooth out the surface with a small offset spatula. Bake for 35 – 36 minutes or until cake is lightly golden brown and the center is set to the touch. Remove from oven and set on cooling rack for 10 minutes. Gently remove cake from cake pan, peel off the parchment bottom, and set back on the rack until cool. In a small bowl, whisk together the coconut milk, sweetened condensed milk, and heavy cream. When the cake is cool, set it on a large rimmed serving platter. With a skewer, or fork, poke holes all over the surface of the cake. Using a pastry brush, brush all of the coconut milk mixture over the porous surface of the cake. Let coconut lime cake sit for at least 30 minutes. 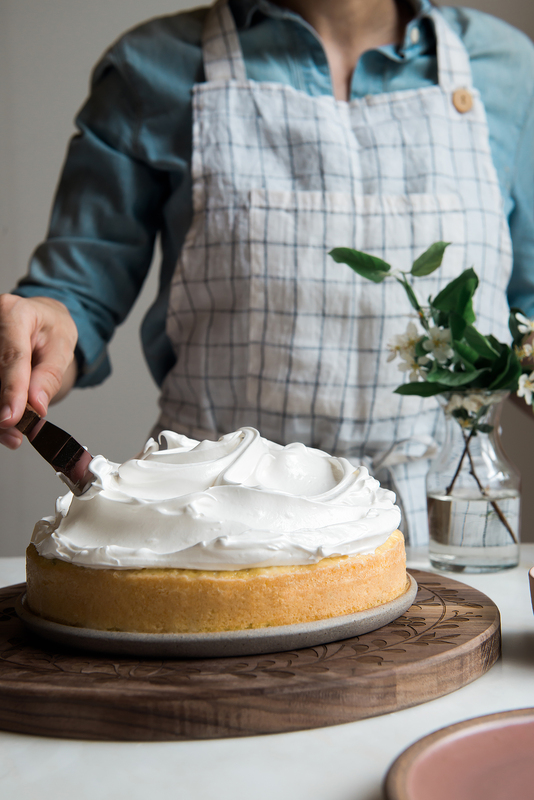 With an offset spatula, or spoon, dollop on the meringue topping. Swirl decoratively until the meringue reaches the outer edges of the cake. Using a kitchen torch, lightly toast the meringue swirls. 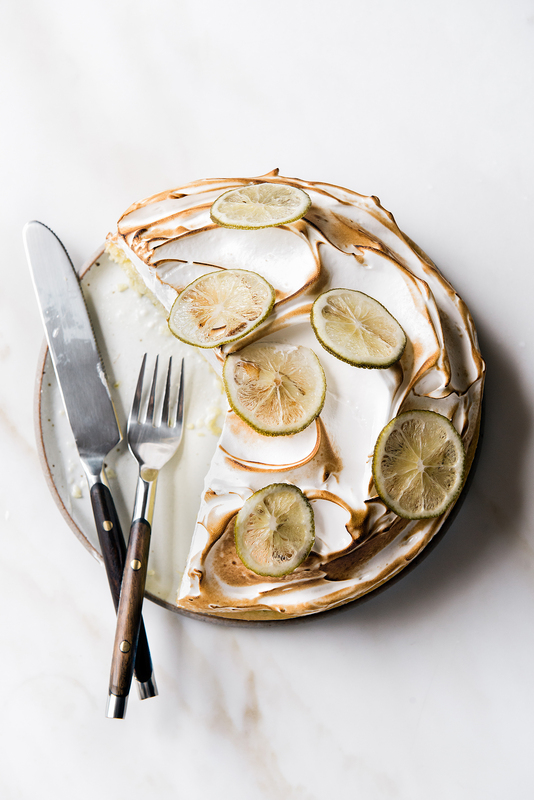 Top the toasted meringue with candied lime slices. Cut and serve with individual candied lime slices. Coconut Lime Tres Leches cake is best enjoyed the same day it’s decorated. In a small saucepan, combine the sugar and water. Set over medium-high heat and cook, without stirring, until the syrup reaches 240F (115C) on a candy thermometer. Meanwhile, combine the egg whites, lime juice, and salt in a the bowl of stand mixer. Whisk, on low, until soft peaks form and the syrup has reached its temperature. Pour the hot syrup down the inside of the bowl in a slow and steady stream. 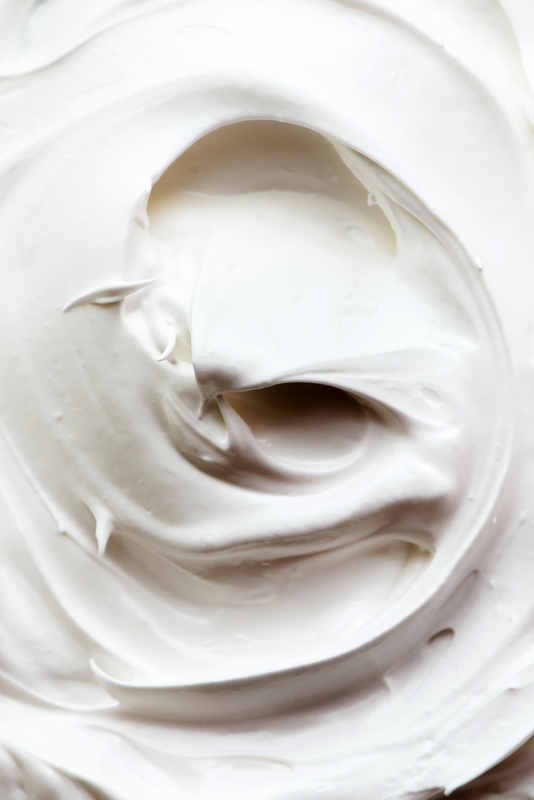 Increase the speed to high and mix until meringue forms glossy stiff peaks and has cooled completely. Tip: Check the coolness of the meringue by placing your hand on the bottom of the mixer bowl while it whips. Add in the vanilla and mix thoroughly. This entry was posted in Cakes, Spring. Bookmark the permalink. Thank you, Kate and Happy Easter! Creativity cannot be forced, it has to be nurtured and given time to manifest right? 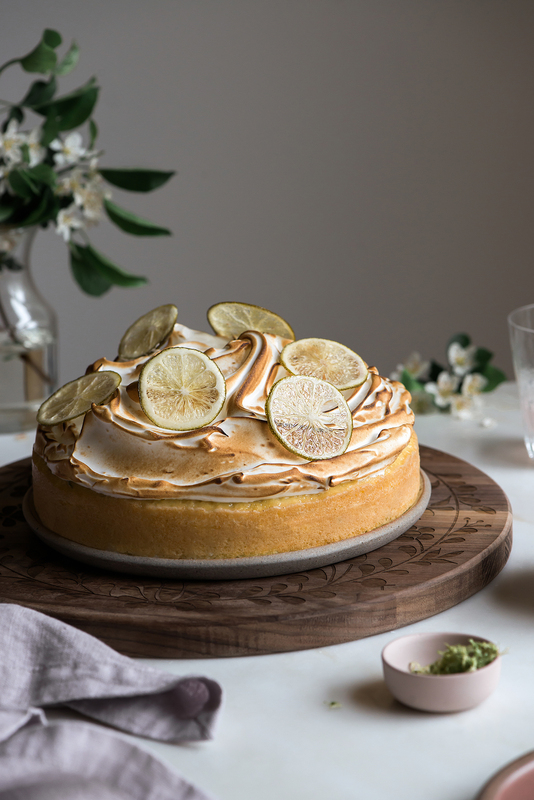 This cake sounds insanely delicious and that cloud of Italian meringue on top is perfection! Very true and thank you! It can feel good to step away and recharge sometimes. :) Happy Easter, Jenny! Happy Easter to you, Laura! Thank you! I can completely agree with getting lost in life and finding creativity slip away at times. I think taking a break can be so beneficial for ourselves and our creativity. I always love seeing what you have to share, this cake is stunning and sounds so delicious. I love the candied lime chips! I always love reading your comments, Lauren. Thank you!